So we got “Ehou-maki” sushi roll from “Sakurai (ryoutei restaurant)” as usual. As the custom was originated in KANSAI area, I myself came to know it after I had moved to Kyoto. Nowadays, it widely spreads even to the other categories than sushi (such as sweets), and we can find a variety of “Ehou-maki”. 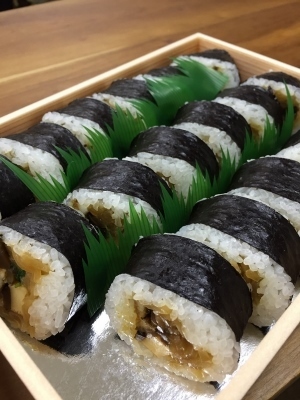 However, at LST Wedding, it becomes our annual event to eat this traditional “Futo-maki” silently, facing “Ehou (=lucky direction of the year)”. Tomorrow is “Risshun (=the first day of Spring)”, so another spring is coming. We will provide sincere service to many client couples in this spring so that they can have happy smiles on their wedding day. Thanks for the delicious “Maki-zushi (=sushi roll)”, Sakurai.